The Skinscape project was inspired from the idea that the natural environment modifies architecture as time passes by and in some instances nature even reclaims it. For example, Banyan trees now cover the Angkor Wat Temple in Cambodia built in 12th century. Experts have decided not to remove the trees because they now serve as part of the structural system – building and nature have become one. 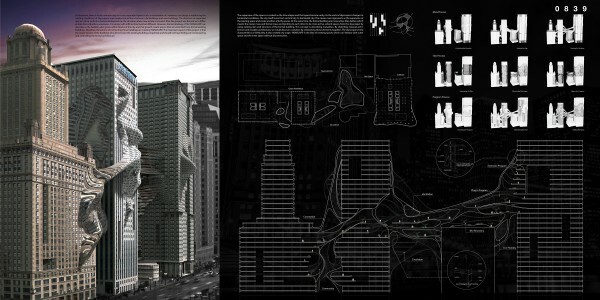 This project explores the possibility of creating a building tissue between skyscrapers. This tissue not only adds unto the buildings but also modifies them to allow for new programs. 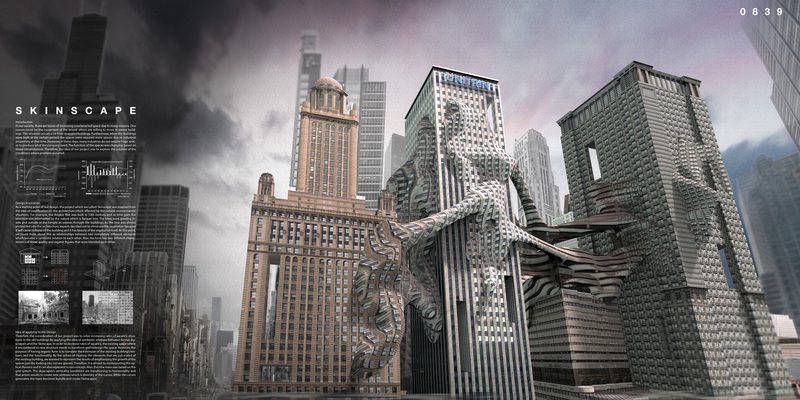 The idea is that buildings need to evolve with time because their initial design intentions and programs morph with time. Vacant space become active and a new hybrid emerges from the integration of two distinct buildings.